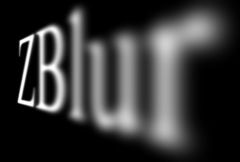 Blurs areas of the source clip by different amounts using depth values from a ZBuffer input. Separates the input into a number of layers in depth and blurs them by different amounts depending on each layer's depth. Linear fog can also be mixed into the result. To use this effect, first set ZBuffer:Black Is Near or White Is Near according to your Z buffer, then adjust the focus depth and depth of field parameters to get the look you want. To help set the focus depth, you can use Show: In Focus Zone. Blur Width: Default: 0.168, Range: 0 or greater. Scales the overall amount of blur. This parameter can be adjusted using the Blur Width Widget. Result: Shows the normal result of the effect. Scales the blur width for parts of the image that are nearer than the focal plane. Scales the blur width for parts of the image that are farther away than the focal plane.